We previously reported how a shortage of inventory in the starter and trade-up home markets is driving prices up and causing bidding wars, creating a true seller’s market. At the same time, in the premium home market, an over-abundance of inventory has started to see prices come down and put buyers in the driver’s seat, creating the beginning of a buyer’s market. Last week, the National Association of Realtors released their Existing Home Sales Report which shed some additional light on the impact of inventory levels on sales in each price range. 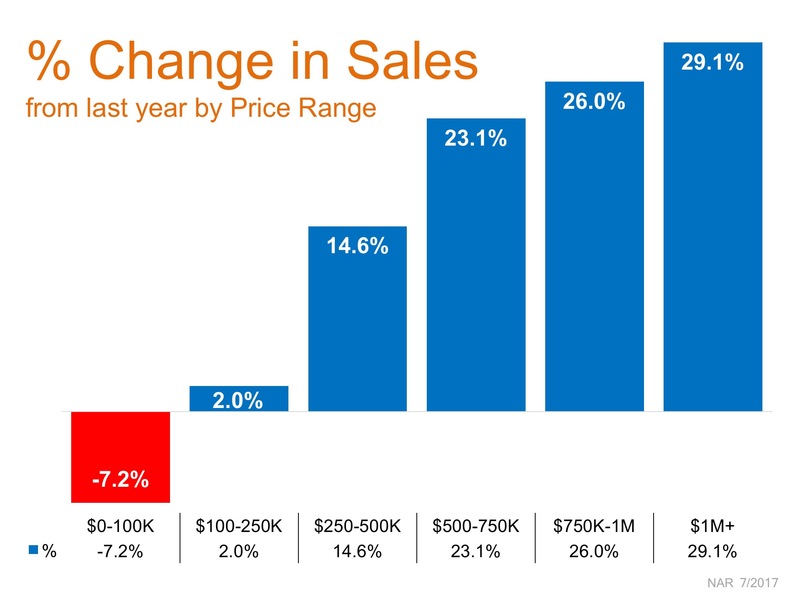 The chart below shows the year-over-year difference in sales at each price range. The under $100K range has shown declines in recent years due to the shortage of distressed homes available for sale (just 5% of sales this past month, compared to 35% in January 2012). Sales in the next two price ranges are no doubt being hindered by low inventory as buyers compete for the same home. The biggest surprise? This is the first time in years where the $1M and up price range had the highest jump in sales when compared to last year and to all other price ranges (29.1%)! The two price ranges right underneath the $1M range were a close second and third. As the price went up, so did the sales! If you are one of the many homeowners who is looking to sell your starter or trade up home and move up to a luxury home, now is the time! Next PostNext 75% of Homeowners Think Now is a Good Time to Sell!